Hilary lives in Felpham where she is a member of Felpham Parish Council. 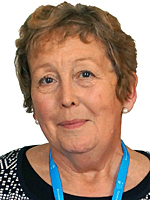 She serves on the parish neighbourhood plan committee and the finance and administration committee. She works part time for a West Sussex MP as a senior parliamentary assistant dealing with local issues, local businesses, liaison with other councils and most importantly helping with individual constituent’s problems. Her family live locally and in her spare time Hilary enjoys spending time with her grandchildren.